Challenge your students and get them writing. This is a dynamic and experiential workshop to challenge and inspire your students and get them writing. The workshop suits students with either some or no experience of playwriting. During this workshop students explore ways of writing to find an idea, are stimulated to question their concept of what a play is, how to create active and surprising characters and how to create and build dramatic tension through dialogue. Students need to come prepared to participate in both writing and practical exercises. Cost: Workshops cost $350 for up to 30 students in Sydney, for workshops in regional locations check out our Regional Programs. View our Playwriting resources here. A unique opportunity for our students to meet and learn from someone who is actively engaged in the industry. It was great! The students were engaged! I’ve never seen them write so much. Thank you to Belvoir for coming to Kinross Wolaroi School yesterday!! Tahli was amazingly engaging, and the students were utterly enthused about every task they tackled. 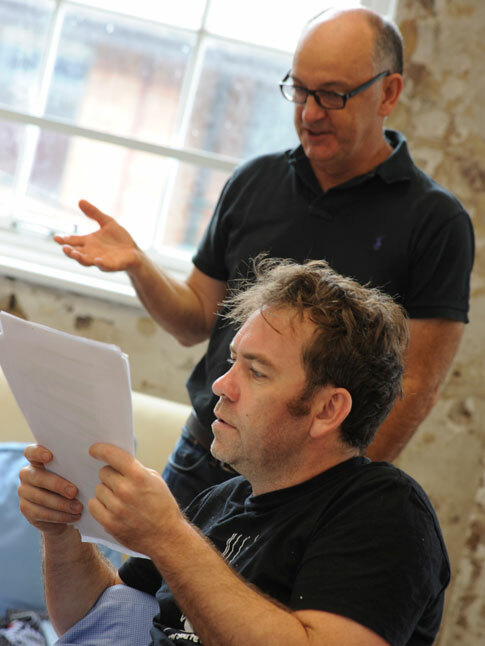 Playwright Michael Gow (standing) & actor Brendan Cowell in rehearsals for Once in Royal David's City. Photo: Heidrun Löhr.